Hello all! This is my first show report with Enjoy the Music.com so please forgive any omissions, poor photography, forgotten names, or missing model numbers. My presence at VSAC, including my status as a reviewer, was very much a last minute arrangement. I will not make any negative comments on rooms I felt to have lackluster sound, as show conditions can be brutal and make great systems sound horrible. I will point out the systems I felt to be good performers however. 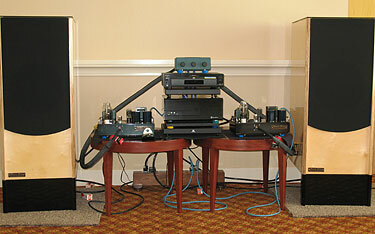 Exemplar audio had a big 3-way system, horn-loaded bass/mid/treble, and Karlson subs. The pictures, sadly, didn't come out, I had issues with my photography in the darker rooms, which it certainly was. Gorgeous looking speakers, and the mid/treble horn had a surprisingly wide bandwidth. Crossover for the bass horn to mid/tweet was at 750Hz, 2nd order. 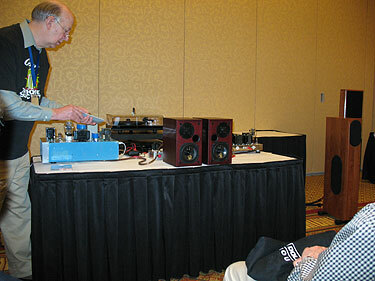 Eficion had a 2-way with Aurum Cantus drivers, a 7" poly midwoof and a ribbon. Very good sound here, good driver integration, a little bit of poly coloration though. Nice woodwork and stands, the speakers are available in bamboo construction. How I missed snapping a shot is beyond me, but they were quite attractive, with matching stands that extend the baffle downward and mitigate some baffle step loss. Here's an early demo I attended. The idea was to compare push-pull and parallel single-ended sound. The results were interesting, but would need much more time to draw any hard conclusions. Interesting nonetheless! PP sounded better on mono sources, and PSE beat it out on stereo sources- even when only one channel was playing... strange! Lowther America's room. This was the best sound at the show, to my ears. Very big, dynamic, open sound, with lowther AlNiCo Goodness via the PM6A. 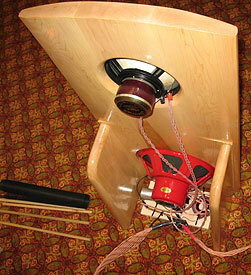 The woofer is a "Tone Tubby" AlNiCo guitar speaker. Crossover is first order series at 200Hz. The sub is a Hartley, a continuous breakup mode speaker. The smaller horns (Alerions) sounded excellent as well with the DX55. 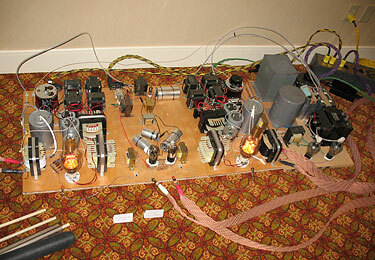 Wiring was via Jena Labs, and source was high-res digital from Viewpoint Records spinning off a hard drive. 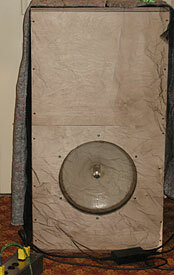 Rear view of the loudspeaker. Hartley Sub in a shipping crate container, 9 ft^3 or thereabout. Shock hazard amps from Experience Music in Lowther room! Kittens and babies beware! Serious Stereo everything. Source was a hard disk driven system, SET amplification. Very good bass extension, but a little lacking in bass resolution, and there was some upper mid/lower treble honk going on. The system is really meant to be corner loaded, and that may well have brought some bass improvements that could have also balanced out the mids better. Despite this, it was one of my favorite systems at the show. 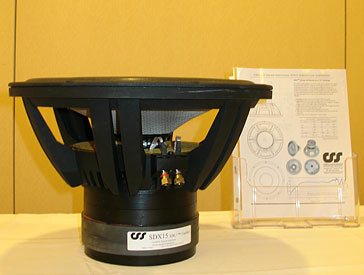 I'd love to hear these speakers again (Altec Coaxial based Transmission Lines) with some corner loading. Occam Audio had a number of kits on display, using the excellent Creative Sound Solutions drivers (WR125/WR125ST, and a 6.5" midwoof made as a drop-in replacement for the "Extremis 6.8" from Adire Audio (now defunct). These drivers feature excursion linear XBL^2 motors, copper phaseplugs, and the 6.5" has a very cool frame with lots of venting. Note the neodymium motor structure (both also seen in the diycable/exodus audio version of this driver, which uses a paper cone rather than carbon fiber, has a different phaseplug, and isn't a drop-in for the extremis as it's optimized differently). The kit shown is the MTM kit. It is available in a variety of build levels, from drivers, baffle and crossover to pre-made/finished kit. Subduction 15" from Creative Sound. Slick composite cone, XBL^2 motor with huge excursion ability, and nice frame. It would be high on my list of subs to consider if I were in a sub-building frame of mind!